Uttar Pradesh Teachers Eligibility Test (UPTET) 2016 is going to be conducted on 19 December 2016. UPTET Notification is available now. The Exam is conducted by the Uttar Pradesh Basic education Board. This test is mandatory to be a teacher in UP Govt. / aided Schools. It is for Teaching posts in UP Primary & Upper Primary Schools. UP TET 2016 exam will be conducted for primary and upper primary classes aspirants. Around 10 lakh candidates are expected to appear for this exam. Those candidates who wish to become teachers in the primary or secondary schools of the UP Government Schools, must have to qualify this test. UPTET 2016 Notification had been released now. We will update you regarding latest news of UPTET at this page. Uttar Pradesh Teacher Eligibility Test Exam is conducted for Primary Teachers (Class I to V) and Upper Primary Teachers (Class VI to VIII) posts. Paper 1 is for Primary Teachers (Class I to V) and paper 2 is for Upper Primary Teachers (Class VI to VIII). Application forms online registration starting date: 05 October 2016 after 01:00 pm. Last date of online registration: 24 Oct 2016. Last date of complete application form: 28 Oct 2016. Edit in Application form: 03 to 07 November 2016. The written test will be held on 19 December 2016. UPTET Latest News: UPTET Notification had been released on 04 October 2016. Check from below image. Application fee - It can be increased this time. Eligibility Criteria for Primary teacher: Graduation degree with minimum 50% marks with 2 years diploma in special education (D.Ed) OR BTC training from UP OR 4 year diploma in elementary education. For Upper Primary teacher: Those candidates can apply to UPTET 2016 who have Graduation degree with minimum of 50% marks holder candidates with one year degree in elementary education (B.EL.ED) OR BTC training from UP OR 2 years programme in BTC/CT (Nursery)/ NTT. The above details will be updated as soon as official advertisement of UPTET 2016 gets released. Candidates can stay in touch with us for latest updates on UPTET 2016 Notification, Application form, Exam date updates. Uttar Pradesh Basic Education Board invited application for the Teacher Eligibility Test 2016 - 2016. The candidates eligible for the examination can apply through prescribed format before 21 January 2014. Below you will find UPTET exam test pattern and various other details. Exam Pattern for Uttar Pradesh Teacher Eligibility Test 2016 - There will be two papers. Paper 1 is for those who want to become class I-V teachers. Paper 2 is for class VI-VIII upper primary teaching aspirants. A candidate who want to become eligible for both types of class have to appear for both papers. Candidates scoring more than 60% marks will be considered as qualified. Reserved classes reservation as per rules. Eligibility: Candidates should have done graduation with at least 50% marks. Eligibility: graduation with 50% marks. Candidates should have a Bachelor of Education degree. Latest News of UPTET Notification 2016 will be published here regularly. 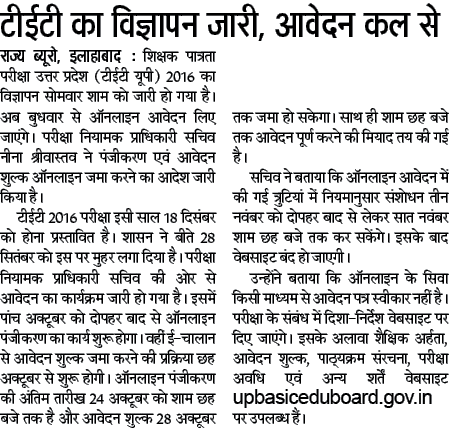 Application forms can be filled at UP Basic Education Board website i.e. 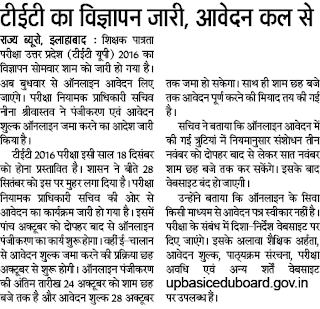 upbasiceduboard.gov.in. The candidates should apply before the last date to avoid last minute website problems. The candidates can follow the below given steps for registering online applications for UPTET 2016. The candidates are advised to read the Instructions thoroughly before making the online applications. Below is the procedure to apply online. 3. Generate the challan and Pay the registration fee at the designated Bank. 5. Print the application form and retain it for future reference.